Two late goals denied Rhyl a memorable Champions League draw against Skonto Riga at a packed Belle Vue. Skonto, who led 4-0 after the first leg of the qualifying tie, opened the scoring in first half stoppage time when Igns Dedora scored from a corner. Gary Powell scored Rhyl's equaliser - the club's first goal in Europe - when he slotted home Chris Adamson's low cross five minutes after the break. But a brace from Mihails Miholaps on 79 and 88 minutes handed Skonto the win. The Welsh champions' physical approach briefly unsettled the Latvians, but their tactics - borne partly of frustration at the visitors' play-acting - never looked likely to disturb Skonto long enough to threaten their four-goal lead. But an encouraging 1,812 crowd might even have gone away celebrating a famous victory had Lee Atherton's 20-yard snapshot midway through the second period not flown narrowly wide. The part-timers failed to create another decent opportunity after that and it was Skonto who strolled to victory with a late double Miholaps. With a line-up containing five of the Latvian squad that drew with Germany at Euro 2004, bolstered by internationals from Georgia and Cameroon, it was little wonder the visitors looked the more fluent side. It seemed only a matter of time before the visitors broke through but some wayward finishing and a couple of brave stops from goalkeeper Paul Smith denied Artur Zakresevskis and Miholaps. 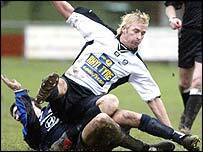 Yet, after gaining a semblance of control at the back, Rhyl were taught a cruel lesson by the side who have won 13 consecutive Latvian titles, as Dedora took advantage of some slack marking to steal in at the near post and steer Aleksejs Visnakovs' corner into the net. Skonto should have doubled their lead within three minutes of the restart, but after the referee had waved play on when Dedora was sent tumbling in the box, Visnakovs blew the obvious advantage by blazing over from six yards. Powell's historic strike followed not long afterwards, but it was the last thing the home fans were able to celebrate on yet another sobering evening for Welsh club football in Europe. Rhyl: Smith, Mark Powell, Brewerton, Jackson, Edwards, Wood, Wilson, Limbert, Gary Powell, Atherton, Adamson. Subs: Billingsley, Graves, Stones, McGinn, Keegan, Hogg, Hunt. Skonto Riga: Piedels, Zakresevskis, Isakovs, Zemlinskis, Nguimbat, Mentesasvili, Miholaps, Visnakovs, Igors Semjonovs, Kalnins, Dedura. Subs: Pavlovs, Blanks, Golubevs, Sevlakovs, Starkovs, Kipiani.